Situated 1 hour?s drive from Rennes, Arobase Hotel is located in Laval, 100 metres from the train station and a 5-minute walk from the city centre. The cinema is 500 metres away and the Exhibition Centre is a 10-minute drive away. All of the soundproofed rooms come with free Wi-Fi, an LCD TV, a work desk and a private bathroom. A buffet breakfast is served every morning on site, and you will also find a bar and a terrace. Some shops and restaurants are available within a 10-minute walk. 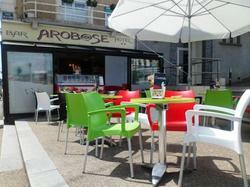 Located 200 metres from the bus station, Arobase Hotel is a 10-minute drive from the A81 motorway.